This is really exciting! Kyle Crockett has designed a new Trackuino shield. Just plug it on top of an Arduino board to turn it into an APRS tracker complete with GPS, a Radiometrix HX1 FM transmitter and a temperature sensor! The whole thing is powered through the Arduino jack (7-12V), and the only external components needed are the GPS and radio antennas. 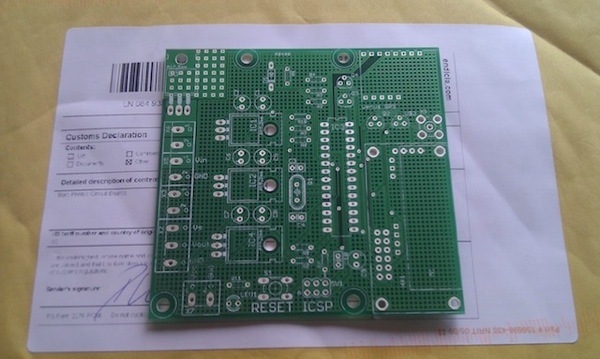 The total footprint is much smaller than the previous board, so its price is also cut by more than half. And because all the Atmega pins are broken out to female headers, It can be easily extended by stacking more shields on top of it. For now, you'll have to figure out the bill of materials from the Eagle schematic, but we'll post a proper BOM shortly. The SCH and BRD files can be downloaded from the project page. KJ6KUV-11 flight and successful recovery! During the whole flight, the balloon was able to steadily report its position via APRS and the trajectory could be followed at aprs.fi. Between 12-16 Km altitude, the balloon caught the jet stream and sped up quite a lot as you can tell by the more spread-out points on the map! 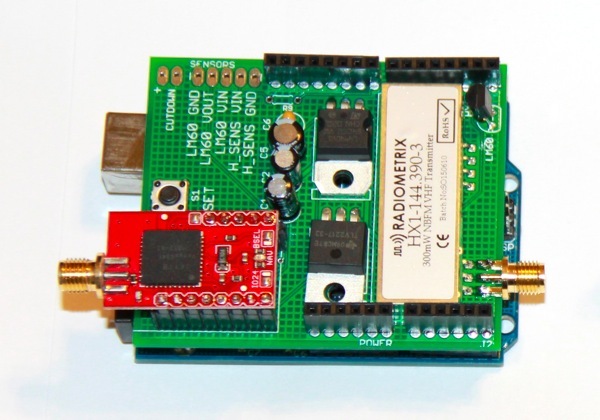 The tracker was a Trackuino board with a Venus 634FLPx GPS and a Radiometrix HX1 300 mW radio transmitter. We were not sure the HX1 was going to deliver enough power to reach any digipeater from that high up. Well, sure it did... At its peak altitude (20 Km), the signal could be heard from Phoenix, Arizona, which is... 597 Km away! We were also not sure the Venus 634FLPx would report its position above 18 Km high, since many manufacturers seem to get the CoCom limits all wrong. But then again, the above picture proves how the GPS worked perfectly at 20036 meters. I'm really excited to announce that Kyle (KJ6KUV), a great contributor to this project, is launching a balloon and he'll be using a Trackuino board to track its payload. He'll be launching from the Oxnard airport (California) on sunday april 17 around 8:00 am pacific time. Best of luck with the chase! The Open Source Hardware, Electronics and Robotics Convention is a 3-day event organized by the Synusia collective in an effort to extend the Open Source Software and to promote electronics and the philosophy of "do it yourself". The event will take place in Madrid at the Centro de Formación Padre Piquer, from the 23 to 25 September 2011. 2. This blog is becoming a bit chaotic, with bits of information here and there. So, I'm giving the Trackuino project's site a facelift. From now on, technical articles will go to the wiki, while news and event updates will stay in this blog. 3. Even though the wiki is pretty much empty right now, I just posted an article on flight prediction based on Rick von Glahn (NØKKZ) great WBALTRAK software. Unlike on-line prediction sites, this program uses actual inflight data to predict the touchdown point with higher accuracy. 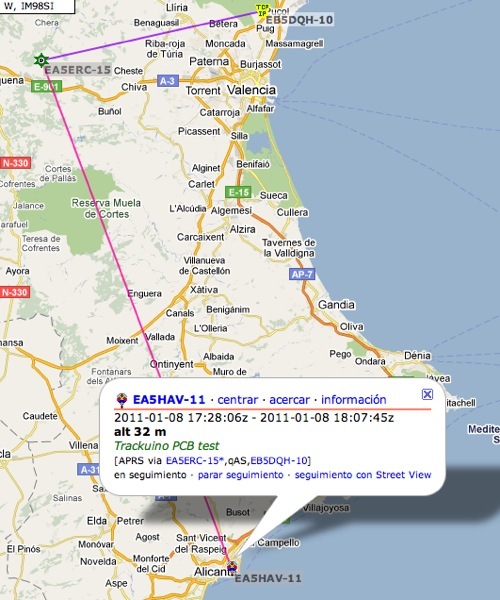 Check it out, I think flight prediction is a key step prior to and during the flight of high altitude balloons! 4. Last, but not least, we're having our first Trackuino flight next sunday! But this deserves a dedicated post, so stay tuned!